Cozy up your outdoor space with warm photos of you and your loved ones. Outdoor pillows are a great way to add color and accent your deck, patio or sun area. Our outdoor pillows hold their color rain or shine and are water resistant, so even in the heaviest of rain, the pillows will be dry fast and ready for use. Choose from one of our templates, or create your own custom pillow for your outdoor living area. 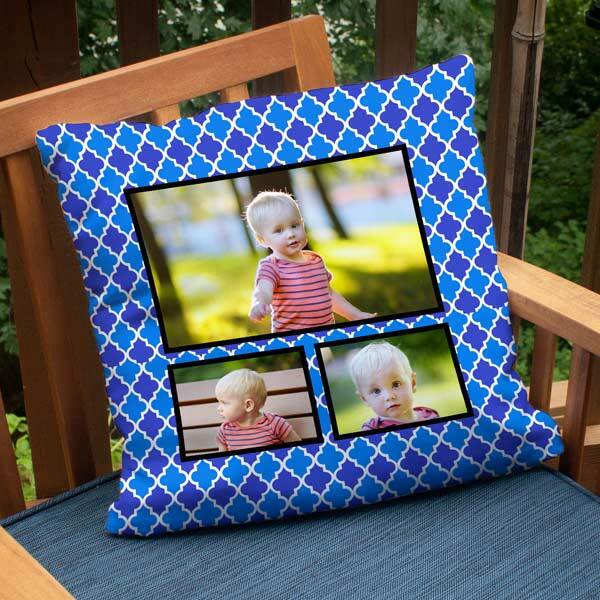 Our outdoor photo pillows come in variety of classic sizes including our 18×18 pillow which is perfect for spicing up any patio sofa. If you are looking for a range of indoor throw pillow options, our custom photo burlap pillows are sure to make a statement on your living room couch or favorite family room chair. Customize both sides! Full bleed single image or collages available, as well as many different styles and background options to help you create your own designs.